The Ally paintings continue to give me enormous comfort, inspiration and power. It is difficult to describe but it is both a warm fuzzy feeling and a stab of challenge like the shamanic teachers in Carlos Castaneda or Lynn Andrews books. It was such a surprise when this particular figure showed up. She looks exactly like Tom’s sister Susan. It made me realize how much I draw/paint by getting inside a person’s body and feeling how it works. I know now that’s how I intuit feelings as well. 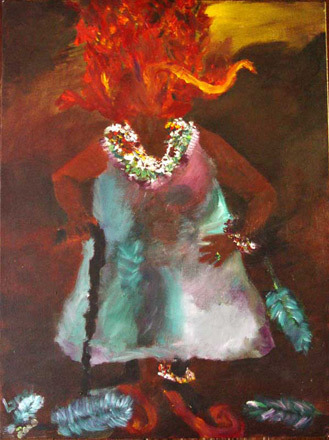 I knew, however, from the minute I started the painting that it was Pele, the Hawaiian goddess of fire and volcanoes, who was coming through to me. Her fiery explosiveness has always intrigued me along with a longing for the lushness of Hawaii that I always thought might alter my dragged down sexual self. Wasn’t the belly dancing I was learning another form of the hula? 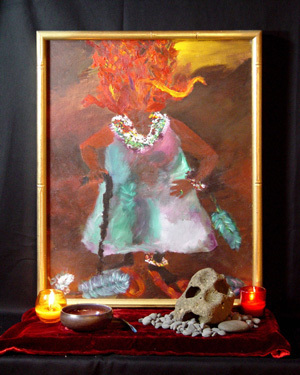 But I wanted to do her not as the lovely young woman as she is usually depicted, but rather as the Hawaiian crone – overweight and crippled by this culture’s overlay of strictures (and scriptures) disguised as sweet treats. As Pele her head bursts with fire and snakes. She obviously is a woman of power despite her cane, a symbol of all her frailties in her human incarnations. I suppose she was a figure of warning to me not to take on the mantle of this culture – especially the prohibitions against seeing into the forbidden worlds of alchemical fire. I’m sure the strong shamans of Hawaii and around the world have taken on their weight, just as I did, to protect our Selves both from our deepest knowings and from the jabs and hurts of this culture towards those who would peek around the sides of rationality and science. Better they jab at us for being fat than being psychic. I didn’t know if I was going to stay fat – in all likelihood I would – but I knew I wanted to honor those who choose that way of protection. Those blue feathers that fall around her were part of a larger mystery that remained a mystery for a long time. They are a theme or a detail in many paintings [see Green Egg and Blue Feather section]. It was only very recently that I realized that the feathers are a call to write about my experiences as well. Luckily I had already gotten the message to write about my paintings – even though I hadn’t realized that was what the feathers were trying to tell me. The rock in the altar assemblage is a local version of the Hawaiian spirit rocks that Tom so loves. In the bowl is volcanic ash from Mount Saint Helens. And it was perfect, of course, to have candles burning.